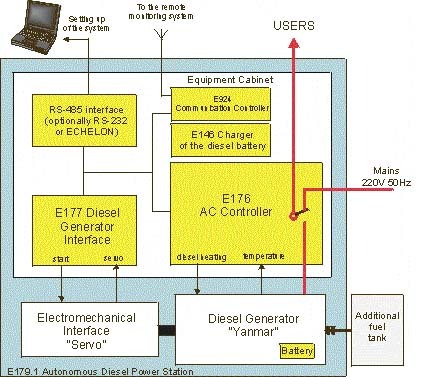 The purpose of the Autonomous Diesel Power Station is to provide single-phase AC 220V/50Hz power supply to the lighthouses or to other users of nominal power up to 3kW. The 220V/50Hz mains and the diesel generator will be used as energy sources. The station is fully automated and, its operation can be controlled remotely by the monitoring system. The AC controller of the station is continuously testing the mains voltage.. When the voltage will become less of a minimal acceptable level, the diesel generator will be started and it will take over the power supply. When the mains voltage level is restored, the diesel generator will be stopped and, energy will be taken from the mains again. Continuous testing of the mains voltage . When the mains voltage drops below the acceptable level, the diesel generator will be started and the users will be switched over to it. Switching the users back to the mains and stopping the diesel generator occurs when the mains voltage is restored. The starting and stopping procedures can be initiated after a time delay, determined by the user. Automatic heating of the diesel engine in the case, when the ambient temperature is below the acceptable level (in winter conditions).Control of the amount of the fuel (optionally). Oil pressure drop below 1 bar stops the diesel engine. - temperature of switching ON of the diesel heating, (-30°C …0°C). - emergency messages about the failures of the diesel generator.